Hitting the midpoint of its 20-game season, the Sun Valley Suns senior men’s hockey team (5-5-0) is showing resilience—while aiming for consistency to put together a win streak. For the second straight weekend the Suns bounced back from a tough one-goal loss in the Friday night game to beat their opponent soundly in the Saturday night rematch at Sun Valley Skating Center. Third-year right wing Bryan O’Connell scored a three-goal hat trick—his 13th in 35 games for the Suns—and ended with four goals for a second straight Saturday as the Suns throttled the Rebels of Salt Lake City 6-3 in the weekend finale. O’Connell (16 goals in 10 games this season) scored four unanswered goals, all in full-strength situations as the Suns erased a 2-1 deficit and beat the Rebels (11-7) for the third time in four meetings this season. The Suns out-shot the Rebels 50-24 and got insurance goals from Chad Levitan and defenseman Danny Ward (power play) when the Rebels narrowed their deficit to 4-3 in the third. Suns goalie Cody Levitan made 21 saves for his fifth win. It was a different story Friday night as 41-year-old Rebels goalie Mike Brennan (36 saves) shut down the Suns in the final 38 minutes en route to as 4-3 Utah victory. Brennan used his 6-6 wingspan to rob O’Connell on a shorthanded breakaway early in the third period to preserve the 4-3 Rebels lead. The Rebels overcame an early 2-0 Suns lead Friday to score four straight goals in a 12-minute span of the first period and force Suns coach Steve Morcone to relieve Levitan of his duties for the night. It certainly wasn’t Levitan’s fault. The coach summoned 10th-year Suns goalie Ryan Thomson from the bullpen and Thomson played fine hockey in his first game back from a knee injury. He shut down the Rebels without a goal in the second and third periods and finished with 10 saves on 10 shots. “Ryan played out of his mind,” said Morcone. “We came up a little short Friday night. Even though we looked good in the first 10 minutes when we went ahead 2-0, I think we may have underestimated them (the Rebels). What makes O’Connell’s Suns scoring stats even more impressive is the fact that of his 59 goals in 35 games over three seasons, only seven have come on the power play. His New England line with center Jon Duval and left wing Doug Yeates has scored 24 of the 50 Suns points over the last four games—and Yeates picked up his first Suns goal Friday. Next: The Suns entertain the Missoula (Mt.) Cutthroats in what has become one of the top Sun Valley rivalries. The Suns lead 7-5 in the six-year, 12-game series. Seven of the 12 games have been decided by a single goal. Last year, Missoula won 1-0 and the Suns rebounded 5-3. Opening faceoffs are 7 p.m. Friday and Saturday, Jan. 11-12 at Sun Valley Skating Center. This weekend’s benefit is The Sage School of Hailey. FIRST PERIOD—(1) SV, Scott Winkler 5 (Chad Levitan, Ivars Muzis), 3:49, power play goal. (2) SV, Doug Yeates 1 (Jon Duval, Danny Ward), 4:49. (3) Rebels of SLC, Tim Monell 9 (Cory Joosten), 6:11. (4) Rebels of SLC, Weston Nash 16 (Todd Potemba), 8:22, power play goal. (5) Rebels of SLC, Joosten 6 (Monell), 12:47, shorthanded goal. (6) Rebels of SLC, Monell 10 (Joosten, DJ Strader), 17:45, power play goal. SECOND PERIOD—(7) SV, Danny Ward 2 (Yeates, Duval), 2:05, power play goal. SHOTS ON GOAL—Rebels of SLC 12-7-3 for 22; Sun Valley 14-16-9 for 39. GOALIES—Rebels of SLC, Mike Brennan (36 saves); Sun Valley, Cody Levitan (first 18 minutes, 8 saves, 4-4-0 record) and Ryan Thomson (final 42 minutes, 10 saves). OFFICIALS—John Heinrich and Pat Ballou. NOTES—Suns forward lines were Doug Yeates-Jon Duval-Bryan O’Connell, Scott Winkler-Chad Levitan-Zac Greenawalt, Jackson Morgus-Charles Friedman-Danny Gariepy. Defensemen were Ivars Muzis, Rob Morgus, Bryan Winkler, Danny Ward and Trevor Thomas….For the game, both the Suns and Rebels were 2-for-8 on the power play. Penalty minutes were 40 for Sun Valley and 26 for the Rebels….Sun Valley’s third-period comeback attempt was stymied by penalties that put the Suns in shorthanded situations for about six minutes midway through the stanza. Penalty killers like O’Connell, Ward, Chad Levitan and Yeates did a good job killing off the penalties and keeping the Suns in the game…..This season, the Suns have had a tough time in the first periods of its 10 games, being outscored 20-14 by opponents. In contrast, the Suns have outscored foes 20-9 in the second periods and 16-9 in the third periods…..The Suns are 1-3-0 in games decided by one goal……Tonight’s benefit was Girls on the Run…..Rebels goalie Mike Brennan helps out coaching the Weber State University men’s club hockey team based in Ogden. At 6-6, he used to play defense for the University of Alabama-Huntsville and also for Weber State in the late 1990s, but switched to goalie because it was easier on his body. At age 41, he gets a kick out of telling the younger players what it was like playing college hockey 20 years ago…..Brennan isn’t the only tall Rebels player. The goalie said that defenseman Todd Potemba is 6-9. FIRST PERIOD—(1) Rebels of SLC, Tim Monell 11 (Cory Joosten, DJ Strader), 5:53. (2) Rebels of SLC, Devon Morris 1 (Rustin Hocker, goalie Travis Pierce), 17:24. (3) SV, Bryan O’Connell 13 (Jon Duval, Doug Yeates), 17:45. SECOND PERIOD—(4) SV, O’Connell 14 (Bryan Winkler), 0:49. (5) SV, O’Connell 15 (Duval, Jamie Knight), 15:32, hat trick goal. (6) SV, O’Connell 16 (Danny Ward, Duval), 16:00. THIRD PERIOD—(7) Rebels of SLC, Monell 12 (Strader, Joosten), 4:17. (8) SV, Chad Levitan 5 (John Miller), 7:07. (9) SV, Danny Ward 3 (unassisted), 10:22, power play goal. SHOTS ON GOAL—Rebels of SLC 7-4-13 for 24; Sun Valley 12-14-24 for 50. GOALIES—Rebels of SLC, Travis Pierce (44 saves); Sun Valley, Cody Levitan (21 saves, 5-4-0 record). OFFICIALS—Bobby Noyes and Dave Patrie. NOTES—Good hard forechecking work by forwards Jackson Morgus and Ryan Kolquist, back from a concussion, freed the puck for Danny Ward’s power play goal that finalized the score in the third period…..Suns goalie Cody Levitan stopped a breakaway by Rebels’ forward Cory Joosten with 7:30 to play in the game…….Chad Levitan persisted and, with Johnny Miller’s help, Levitan produced the key goal of the game with 13 minutes left. After Rebels goalie Travis Pierce made a fine save on Levitan, Miller’s forechecking and being in the right place at the right time kept the puck in Sun Valley’s possession. Miller found an opening, gathered the puck and gave it to Levitan on the wing. Levitan flicked the puck over Pierce’s left shoulder for a 5-3 Suns lead……Seventh-year center Jon Duval, enjoying his best Suns season as the team captain, led the Suns weekend scoring with 5 assists…..Tonight’s benefit was the Sawtooth Pony Club…..Suns forward lines featured Doug Yeates-Jon Duval-Bryan O’Connell, Scott Winkler-Chad Levitan-John Miller, and Jackson Morgus-Charles Friedman-Blake King/Ryan Kolquist. Defensemen were Danny Ward, Jamie Knight, Rob Morgus, Zak Greenawalt and Trevor Thomas…..Suns back-up goalie was Bobby Farrelly……Thomas received a game misconduct after taking cross checking and boarding minors midway through the second period……Rebels of Salt Lake forward lines were DJ Strader-Cory Joosten-Tim Monell, Weston Nash-Dalton Smith—John Hildreth, Brandon Henricksen-Phil Macdonald-Johnny Vance, Clarke Gayner-Devon Morris-David Snyder….Defensemen included Rustin Hocker, Todd Potempa and Zach Smith…..Rebels back-up goalie tonight was Mike Brennan….Leading the Rebels weekend scoring were Monell and Joosten, each with 5 points. Monell, 23, is a 6-0, 190-pounder from Plano, Texas, while 6-3, 200-pound Joosten, 23. hails from Salt Lake City……The Suns swept the season series with the Rebels, winning three of the four meetings by a combined 22-8 score, all games on Idaho ice……The U.S. National Junior Team defeated Sweden 3-1 at Ufa, Russia Jan. 5 to capture the gold medal at the 2013 International Ice Hockey Federation (IIHF) World Junior Championships. It was the third time in four years the U.S. has earned a medal at the IIHF World Junior Championships, two of them gold (2010 and 2013). The U.S. went 5-2 in the tournament, winning their final four games after 2-1 losses to Russia and Canada Dec. 28 and 30. The Americans beat the Czech Republic 7-0 in the Jan. 2 quarterfinals, got past Canada 5-1 in the Jan. 3 semi-finals and beat Sweden in the gold medal game. Head coach was Phil Housley of South St. Paul, Minn., who is head coach at Stillwater (Minn.) High School. The team’s Director of Player Personnel was Tim Taylor of Guilford, Conn., the father of Sun Valley Suns forward Justin Taylor……. GOALTENDER.............. GAMES. GOALS... W-L AVG. Shots—Levitan 232, Thomson 46. Saves—Levitan 202, Thomson 38. Shootout shots—Levitan 8. Shootout saves—Levitan 4. Shootout goals allowed—Levitan 4. Shutouts—0. Empty net goals—0. 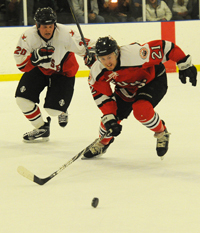 Two-goal games (5)—Jamie Knight 2, Jon Duval 1, Bryan O’Connell 1, Scott Winkler 1. Three-goal hat tricks (or more) (4)—Bryan O’Connell 3 (2 with 4 goals), Chad Levitan 1. Power play goals (12-50, 24%)—Bryan O’Connell 3, Jon Duval 3, Scott Winkler 3, Danny Ward 2, Jamie Knight 1. Power play goals (opposition): 12-42, (29%). Suns shorthanded goals (2)—Chad Levitan 1, Scott Winkler 1. Season penalty minutes: SV 191, opponents 187.